Gallery: 180-degree panoramic spreads of The turris. 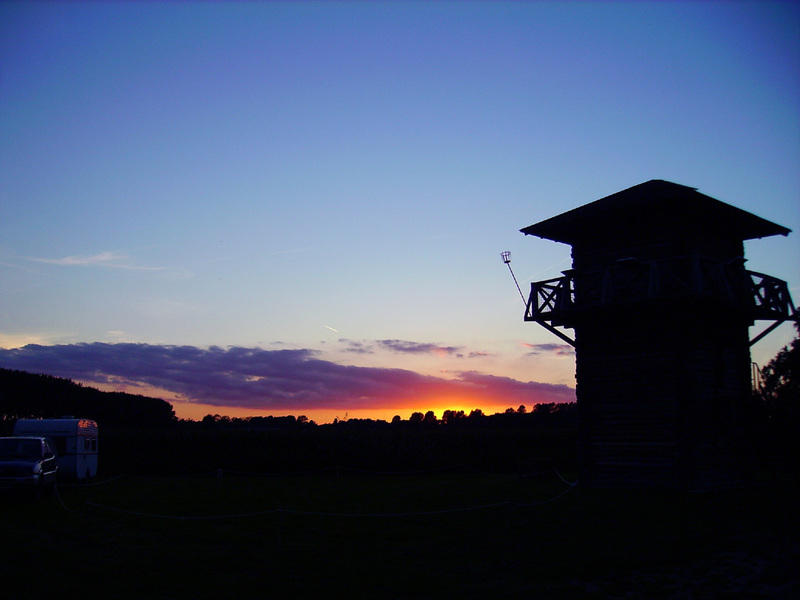 Saturday 15th November 2003, the groundwork was laid for a replica of a Roman watchtower as could be found all along the Limes. 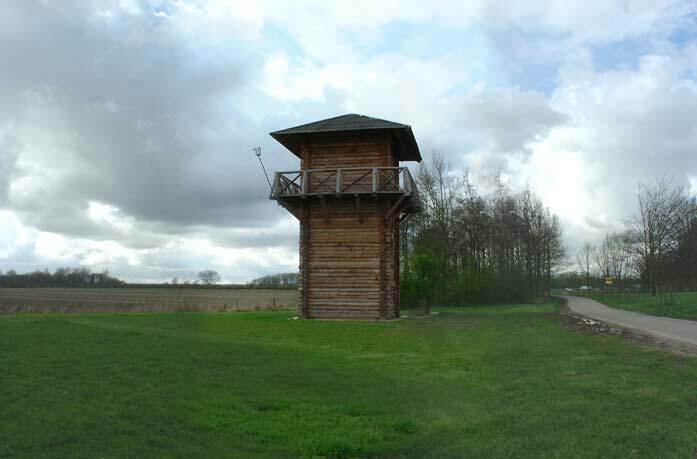 This turris or watchtower has now been built between the 19th-century fortress and the field which still covers the remains of the castellum Fectio. The tower was officially opened on May 16th, 2004. UNFORTUNATELY, AS OF 2012 THE TOWER HAS BEEN CLOSED TO THE PUBLIC. Beautiful colours of the Fall, November 2006. Ready for yet another shower, april 2005. Even though the 19th-century fortress 'Den Burg' at Vechten would seem the furthest from any Roman associations, there can be no question of denying them. The thick brick and concrete walls were constructed between 1867 and 1870 as part of the so-called Nieuwe Hollandse Waterlinie (The 'New Dutch Water Line') to defend the cities of the western Netherlands from overland attack. However, the spot which was chosen to erect this fortress, happened to be chosen before, for a similar purpose: the Roman Limes. The Romans, who apparently chose the spot because it controlled a side-arm of the Lower Rhine, built their castellum by the year 4 AD, and possibly named it after that river, Fectio. This fort was quite important from time to time as a supply-base for the invasion of Germany. It attracted the local population as well, which came to settle in the vicus at either end of the fort. The castellum was most likely abandoned by the late 3rd century, when the Roman Empire faced crisis after crisis. However, the main reason that the army never returned may well have been because the access to the fort silted up, which caused it to become land-locked, with all the ensuing logistical problems. The neighboring castellum at Trajectum/Utrecht may have supplanted it as local fort. Anyway, by the late 19th century the Dutch engineers built their new fortress dead east of the old castellum on top of the vicus, without even knowing it existed. 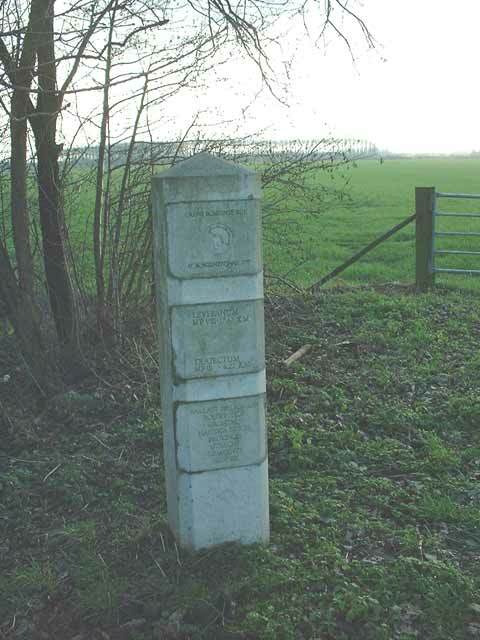 A modern milestone of the 'Limes Path'. The tower, nearly finished, spring 2004. Luckily, when all kinds of ancient artefacts started turning up, one of the oficers had the bright idea to contact the Museum van Oudheden (M. of Antiquities) in Leiden about these strange objects which were dug up by the workers. Because of that action, a great collection of Roman artefacts has been rescued, even though the proper excavation of the castellum nor the vicus ever took place. How could it, the science of archeaeology did not yet exist by then. Today, the castellum still rests under its orchard, but the society which now runs the fort (as of 1996), has taken the first step to create a link between the two. 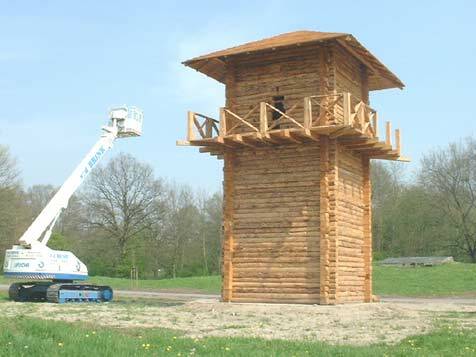 During the winter, a replica of a Roman watchtower will be constructed of wood, to be opened for the public by may of 2004. With this visual sign, it is hoped that the public will become aware of the Roman past so long hidden beneath their feet. The provincial government has developed plans to make the castellum more visible to the public. The tower slowly becomes famous as a Roman landmark, both in The Netherlands as well as abroad! Gallery: 57 pics from 2008. Gallery: 100 pics from 2007. Gallery: 38 pics from 2006. Gallery: 76 pics from 2005. Gallery: 28 pics from 2004. Gallery: 30 pics of The first event during the grand opening. Gallery: 43 pics of The construction of the turris. Gallery: 20 pics of The blessing of the foundations.